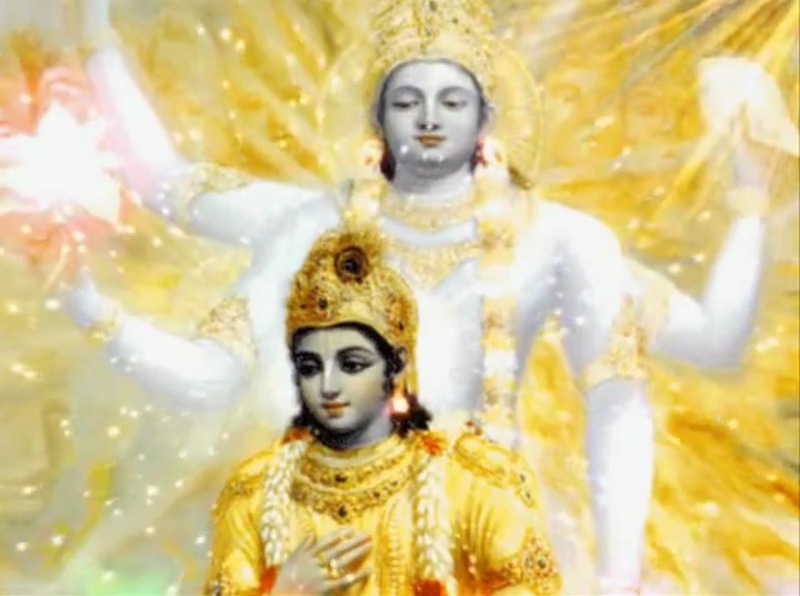 In this Part we will explore the meaning of the thirtieth Shloka of Sri Vishnu Sahasranamam. We are now going through the Namas that describe the Lord’s Vishvaroopa. Sri Adi Sankara gives the reference from the Bahagavad Gita – tejas-tejasvinAm aham (7-10), and balam balavatAam cAham (7-11). This is a combination of four words Ojah, Tejah, Dyuti and Dharah. Ojah means strength or inherent vitality, Tejah means reputation or power to overcome enemies, and Dyutih means effulgence or radiance. Dharah means one who carries these qualities. Since Bhagavan alone has all of these qualities, He is Ojas-tejo-dyuti- dharah. In the words of Sri Adi Sankara ‘Ojah Praanabalam, Tejah Shouryaadayo Gunaah, Dyutih deeptih, Taah dhaarayati iti Ojas-tejo-dyutidharah – He is Ojas-tejo-dyutidharah because he possesses the qualities of strength, invincibility and brilliance’. Sri Sankara offers an alternative explanation where he takes Ojastejah as a twin name (Naamadvayam) as expounded in the Bhagavad Gita ‘Balam balavataam chaaham’ (Chapter 7 Verse 11) and ‘Tejas tejasvinaamaham’ (Chapter 7 Verse 10). Ojastejah is the collective strength of the strong and the collective valour of the valiant and Bhagavan carries the essence of these twin qualities. Hence he is ‘Ojas-tejo-dyutidharah’. According to Sri Adi Sankara ‘Prakasha svaroopa Atma yasya sah PrakashAtma – One whose nature is radiance and brilliance’. In the Bhagavad Gita (Chapter 11 Verse 12) we have ‘Divi Surya Sahasrasya bhaved yugapat utthitaa – He is as bright as a thousand Suns descending in the sky all at once’. The writer in Dharma Chakram points out that the Prakasha or light from the Sun and the Stars can reveal external objects, but none of these can reveal the Absolute Truth. The Absolute Truth can be revealed only by Sri MahaVishnu. Another interpretation of Prakasha is in the sense of well-known or popular. So, Prakashatma means somebody whose greatness is well known to everybody. 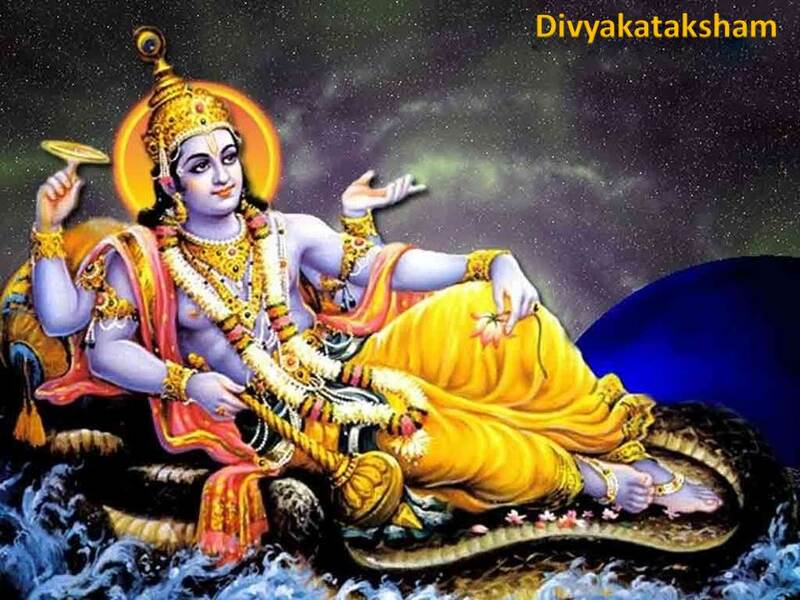 Jaya and Vijaya were the gatekeepers at the heavenly abode of Lord Vishnu. Lord Vishnu once instructed Jaya and Vijaya not to allow any visitors. However, it so happened that the four Kumaras, the sons of Brahma created from his mental powers, came to meet Lord Vishnu. Due to the strength of their tapas, the four Kumaras appear to be mere children, though they are of great age. 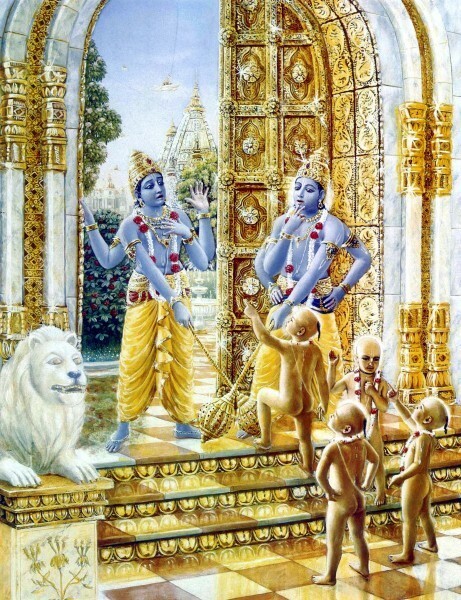 Jaya and Vijaya intercepted the Kumaras at the gate, thinking them to be children. They also tell the Kumaras that Sri Vishnu is resting and that they cannot see him now. The enraged Kumaras replied that Vishnu is available for his devotees any time, and cursed both the keepers Jaya and Vijaya, that they would have to give up their divinity, be born as mortals on Earth, and live like normal human beings. Lord Vishnu appeared before them, and the guards requested Vishnu to lift the curse of the Kumaras. Vishnu says that the curse of Kumaras cannot be reversed. Instead, he gives Jaya and Vijaya two options. The first option is to take seven births on Earth as a devotee of Vishnu, while the second is to take three births as his enemy. After serving either of these sentences, they can regain their stature at Vaikuntha and be with him permanently. Jaya and Vijaya cannot bear the thought of staying away from Vishnu for seven lives. As a result, they choose to be born three times on Earth even though it would have to be as enemies of Vishnu. Jaya and Vijaya first took birth as twin demon brothers, Hiranyaksha and Hiranyakashipu. 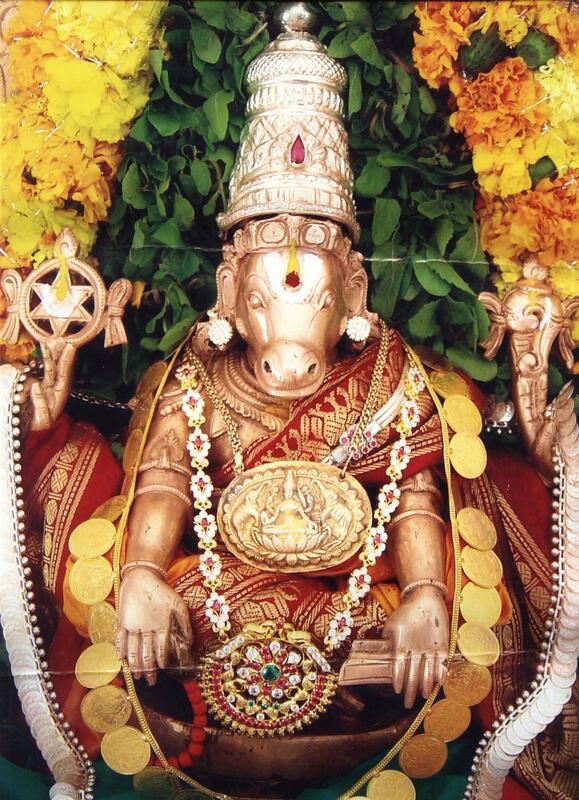 Hiranyaksha was killed by Vishnu in his Varaha (Boar) incarnation & killed Hiranyakashipu in his NaraSimha Avataar. Jaya and Vijaya then took birth as Ravana, the evil king of Lanka, and Kumbhakarna, his younger brother. During this period Vishnu took birth as Rama, the prince of Ayodhya, Lord Rama killed both Ravana and Kumbhakarna. Finally, Jaya and Vijaya took birth as Shishupala and Dantavakra during Vishnu’s incarnation as Krishna. When Shishupala was born, he had three eyes and four arms. His mother Shrutushravaa was horrified and wanted to kill him, but there was a prophecy that said that the extra protuberances would fall off when a certain person took Shishupala in his lap. However that person would eventually slay Shishupala. When Krishna went to see his young cousin and took the baby Shishupala on his lap the extra appendages fell off. Shrutushravaa was aghast that her nephew would kill her son. 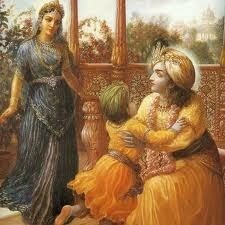 She pleaded with Krishna. Krishna said that he was powerless against destiny, but would forgive a hundred offences before letting the prophecy take effect. Dantavakra was born with protruding and jagged teeth. Dantavakra literally means “crooked teeth”. Shishupal’s father Damghosh was the king of Chedi and Dantavakra’s father Vriddhasaman was the king of Karusha. Both were under the sovereignty of Jarasandha, emperor of Magadha. Shishupala and Dantavakra grew up under Jarasandh’s tutelage. 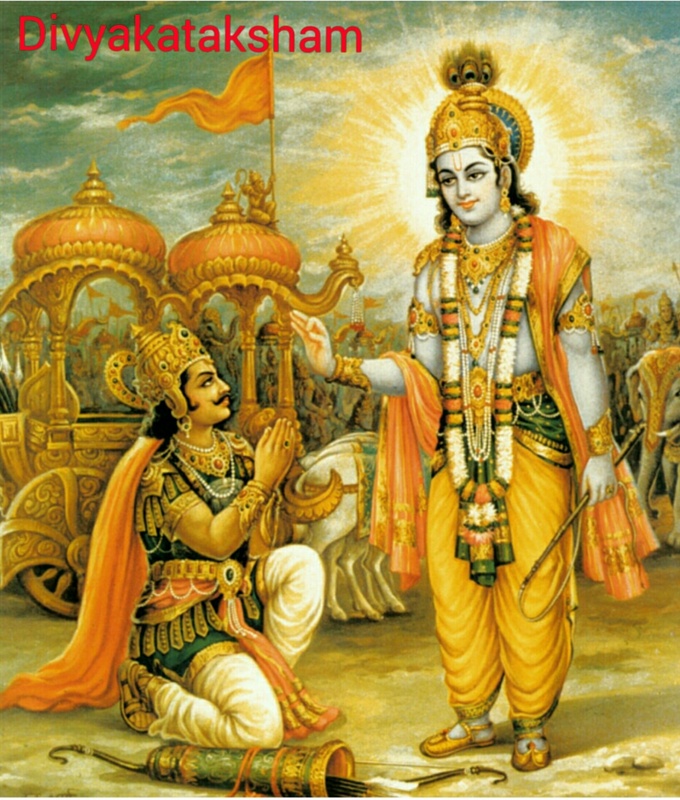 Jarasandha’s attempt to subjugate all around him was thwarted by Krishna and hence he hated Krishna. This hatred was naturally shared by Shishupala and Dantavakra. During Yudhishthir’s Rajasuya Yajna, Shishupala objected to Krishna presiding over the ceremony. How can a cowherd be given this exalted position when so many kings and sages are present he argued. 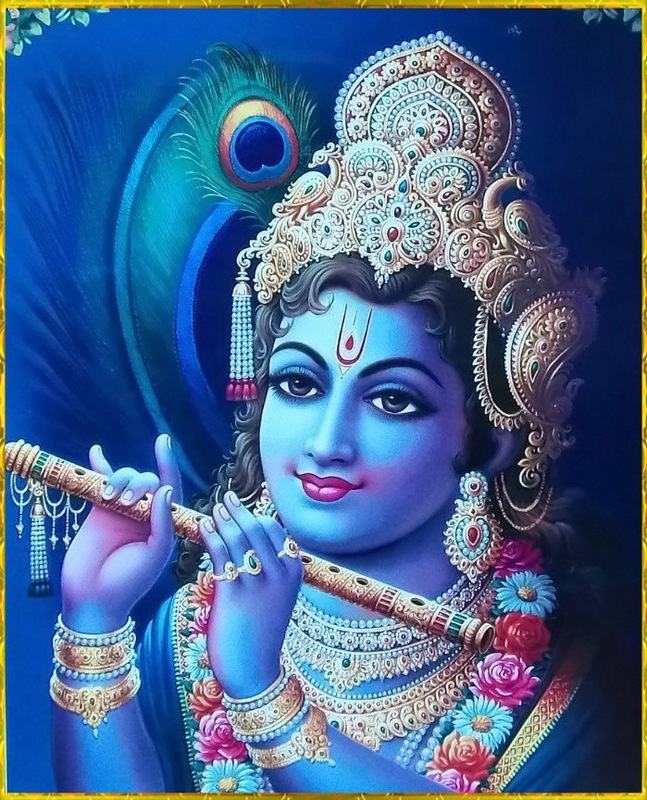 He then began to insult and abuse Krishna in front of the August assembly. Shishupala had then transgressed the count of hundred offences and Krishna released his Sudarshan Chakra and beheaded Shishupala. Dantavakra decided to avenge Shishupala’s death. Proud and overconfident he fought without armour. 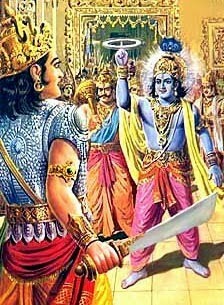 On the battlefield he engaged Krishna in a duel with maces. Krishna easily bore the brunt of Dantavakra’s attack and ultimately he ripped Dantavakra’s heart apart with his mace, Kaumodaki. It is said that after the deaths of Shishupala and Dantavakra, the souls of the deceased merged into Krishna. They were now free from the curse and would reside with Vishnu forever. The circumstances of Shishupala resulted in his thoughts being constantly engrossed in the Supreme being, he was united with the Vishnu as the Lord bestows a heavenly and exalted station even upon those whom he slays in his displeasure. This comes from the root word ‘tap’ meaning ‘to scorch’ or ‘to burn’. Sri Adi Sankara interprets this by saying ‘Savitraadibhih vibhootibhih vishvam prataapayati iti Prataapanah – He scorches the world in the form of his radiating manifestations such as the Sun’. Sri Parasara Bhattar interprets this Nama in the context of Bhagavad Gita where Arjuna says ‘tejobhiraapoorya jagat samagram Bhaasastavograah pratapanti Vishno (Bhagavad Gita Chapter 11 Verse 30) – that he is unable to stand the sight of the magnificent Vishvaroopa Darshan (Cosmic form) when Lord Krishna reveals that all beings are finally falling into the fiery mouth of the Lord and being scorched to their end. Sri Radhakrihna Shastri points out that this can also refer to the time of Pralaya when the Lord scorches the Earth with HIS all-consuming fire. The root from which this word is derived is Ridh which means to prosper, to increase. Sri Adi Sankara explains this as ‘Dharma Jnana Vairaagyaadibhir upetatvaat Riddhah – He is Riddhah because he is overflowing with Dharma, Jnaana and Vairaagya which are Righteousness, Knowledge and Dispassion’. Bhagavan says (Bhagavad Gita Chapter 10 Verse 40) ‘Naantosti Mama Divyaanaam Vibhooteenaam parantapa – There is no end to my divine splendours’. He is the best of everything and he has the best of everything. In short he is Riddhah. Sri Adi Sankara interprets this as ‘Spashtam Udaattam Omkaara lakshanam aksharam asya iti Spashtaakasharah – He is the sum and substance of the primordial sound ‘OM’ or the Supreme sound of Pranava’. “One who chants my name (the letter OM or the Pranavam) and leaves his body at the time of death thus remembering Me, he shall attain the Supreme state”. Sri Bhattar’s interpretation is that He is Spashtaaksharah because He revealed Himself through the letters of the Vedas very clearly. The reference here is to the text of the Vedas. Sri Satyadevo Vasishtha gives a very different interpretation. He uses the root spas bandhane – to tie together, and akshara to mean things that don’t disappear but reappear again and again until and even after pralaya – (he uses the words Apralaya sthaayI nakshatraadi in Hindi viz. the nakshatra mandala etc.) Thus he interprets this name’s meaning as referring to MahaVishnu who has tied together and is holding together this Universe with its constellation of the heavenly bodies. There are 2 possible interpretations. Mantrah stands for the mantras or the hymns in the Rig Veda, Yajur Veda and Sama Veda and Bhagavan is the embodiment of these mantras. Sri Adi Sankara says ‘Rig Yajus Sama Lakshanah Mantrah – He symbolises the hymns of the 3 Vedas hence he is called Mantrah. The other meaning is ‘Mantrabodhyatvaat Mantrah – All mantras seek to find him hence he is Mantrah’. Tan-mantAram trAyate iti mantArah, or Mananaat traayate iti mantrah meaning Mantra is that which protects those who meditate on it. “He who thinks of me always, will certainly cross this vast and frightful sea of Samsara which is filled with the waters of greed and avarice”. “The man who, when his mind is in normal condition, when the body is not shattered, and when the elementary constituents of his body (dhAtu-s) are in perfect equipoise, meditates on Me who has the world as My body and who am not subject to births due to Karma – when that man lies like a log of wood or a piece of stone in his dying moments, I think of this devotee of Mine and lead him/her to attain the Supreme Abode”. The writer in Dharma Chakram gives the perspective on the importance of mantras in our scheme of life. Just as we take external bath for keeping our bodies clean, mantras are the means to keep our minds clean. This can be done either through constant repetition of the mantras (Japam), through deep and constant contemplation (Dhyaanam), through musical singing (Bhajans) etc. Thirumangai Alvar says – ‘Nalamtarum Sollai Naan kandu konden Naraayanaa ennum naamam’ – Peria tirumozhi1-1-9. Chandra is the Moon and Amshu is the cool light emanating from it. As Sri Adi Sankara puts it ‘Samsaara taapatigmaanshu taapataapita chetasaam chandraamshuriva Aahlaadakaratvaat Chandraamshuh – He gives cool comfort to those who are scorched by the terrible heat of Samsara or the life cycle in this world, hence he is called Chandraamshuh’. The word Chandra is derived from the root ‘Cadi AhlAde dIptau ca’ meaning to delight, to shine. He brings delight to the minds of those who are scorched by the heat of Samsara. ‘Pushnaami chaushadeeh sarvaas somo bhootvaa rasaatmakah’- Bhagavad Gita Chapter 15 Verse 13. It is known in experience also that the cool rays of the Moon are soothing and nourishing. Bhagavan is like the rays of the Moon for His devotees. According to Sri Adi Sankara, this Nama means ‘Bhaaskara dyuti Saadharmyaat Bhaaskaradyutih – His brilliance is in the nature of the effulgence of the sun. Hence he is called Bhaskaradyutih’. Dr. V. V. Ramanujan in his Vishnu Sahasranama Bhashyam points out the significance of the two names – Chandraamshuh and Bhaskaradyutih occurring together. 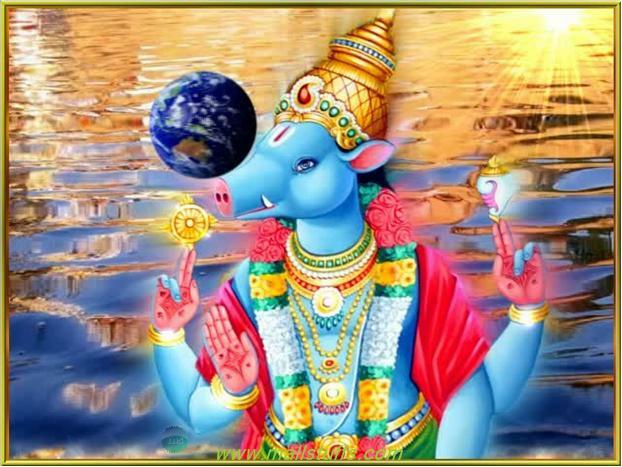 It is unique that Bhagavan has at the same time the comforting coolness of the Moon and the scorching heat of the Sun in Him- He is soothing to His devotees and scorching to His enemies. He is Bhaaskara-dyutih also because He is the cause for the dyuti or brightness of Bhaaskara or the Sun, or for that matter, the brightness in every one of us. We can see the brightness of the Sun but we cannot see the brightness of Sri MahaVishnu. The reference to Andal’s Thiruppvai (kadir madiyam pOl mugattAn) is also relevant in this context. The description of the Vishvaroopam continues, and we know from Arjuna’s description that the Tejas of the Lord is scorching and frightful. An instance of this simultaneous existence of the cooling and burning Gunas of His Tejas is the Narasimha Avatar, where His form terrorised Hiranyakashipu, while HE was divinely pleasing to Prahlada. “If simultaneously thousands of Suns appeared in the sky shining bright, the Tejas or effulgence of them will be a fraction of that of the Lord”. Bhagavan is endowed with strength, vigour and brilliance. The Lord is radiant and PrakashAtma as HE is source of light to the Sun and the Stars. He scorches the world in the form of his radiating manifestations such as the Sun. 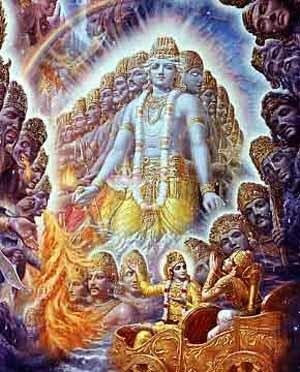 At the time of Pralaya the Lord scorches the Earth with HIS all-consuming fire. HE is Riddah as He is complete in all aspects of Dharma (Righteousness), Jnana (Knowledge) and Vairagya (Dispassion or Renunciation). He is the sum and substance of the primordial sound ‘OM’ or the Supreme sound of Pranava. He symbolises the hymns of the Vedas hence he is called Mantrah. He gives cool comfort to those who are scorched by the terrible heat of Samsara or the life cycle in this world, hence he is called Chandraamshuh. His brilliance is in the nature of the effulgence of the sun. Hence he is called Bhaskaradyutih. If simultaneously thousands of Suns appeared in the sky shining bright, the Tejas or effulgence of them will be a fraction of the Lord. Beautiful explanations and stories behind each namas and explaining the significance and as much as possible to explain the tattvam behind each namam. Thank you Sridhar and Balaji garu. While reading the bhashyam on Ojas-tejo-dyutidharah nama, i recollected the bhagavata poem where in one of the greatest devotee prahlada says to his father hiranyakasyapa – “balayitulaku durbalulaku balamevvadu neeku naaku brahmadulakun, balamevvandatti vibhundu balam asurendra” when asked who is the strength behind his son prahlada? the meaning of the poem is, the strength that’s behind the strong, weak, you, me, lord brahma is my strength dear father. Thank you Santoshji. Yes, HE is the source behind all of us and it is He who illumines us all. Hari Om Uncle! As usual first thing I do is read the story then go through the Namas. Lovely story Uncle. I like the Nama Bhaskaradyutih’ I can’t imagine how we can open our eyes to see the Vishwaroop form of the lord if he is so bright, Just like we can’t see the Sun directly. Isn’t it Uncle? Is it true that in most avathars of Dashavathar, he is showing his Vishwaroop form. Example- Matsya the fish shows the gigantic form with so much light. Same in Vamana, Krishna, Narasimha, even in Parushuram, right? Anyways, thank you very much Uncle. Hari Om! Thank you very much Uncle.. Yes I went through the chapter 11. “Na tu mam shaksye drashtumanaev savchakshusha! Divyam dadami te chakshu pashay me yogameshwaram!! Beautiful meaning Uncle. I enjoyed reading this. Sorry for replying late as I was busy studying for my exams. Hari Om! Very beautiful narration Sir. Thank you, Hari Om!